Floating Hotel Room Creating The Ideal Luxury Waterfront Experience, Proposed by Serbian design studio Salt & Water, offers hotel guests the luxury and amenities of a top-notch hotel, along with the privacy of a single cabin. The Floating Hotel Design has a central two-story dock which houses the main lobby. Here, guests can also access the hotel restaurant, event hall and cafe. A Design Studio Salt & Water, specialization in yacht design gives them unique insight and expertise when creating the ideal luxury waterfront experience.Extending from the hotel center are two piers, at which the individual floating catamarans would dock. At the leisure of the guest, the catamarans can be detached from the walkway and navigated to a more private location.Giving guests the ability to navigate their own floating hotel room, affords a customizable and private experience, unlike any other in the hospitality industry. The design allows guests to take advantage of a full-service hotel, or hide away in a private corner of the lake or river at whim. Once they have found their destination, guests swim or fish off the galley or just lounge and enjoy the panoramic scenery. 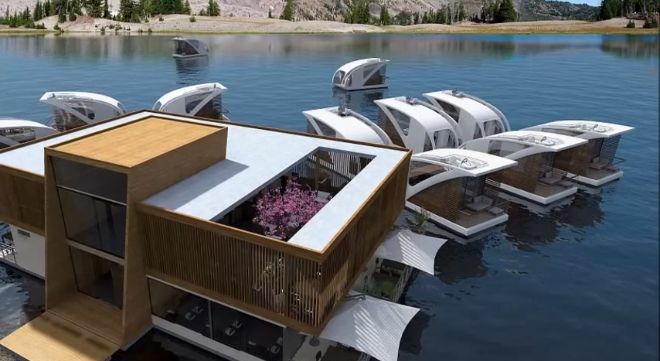 While most hotels can only offer this level of access to guests in premium rooms, the floating hotel catamaran design gives every guest the same luxuries. 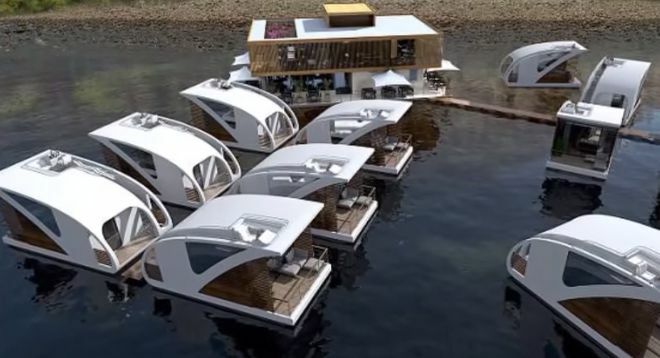 The Floating Hotel Design, which won the Millennium Yacht Design Award, is intended to allow the tourism industry to promote inland waters and smaller rivers, that would previously have been considered too difficult for hotel developers or cruise ships to access. The possibility of strategically-placed smaller docks intended for refreshing rooms and waste collection has also been discussed. 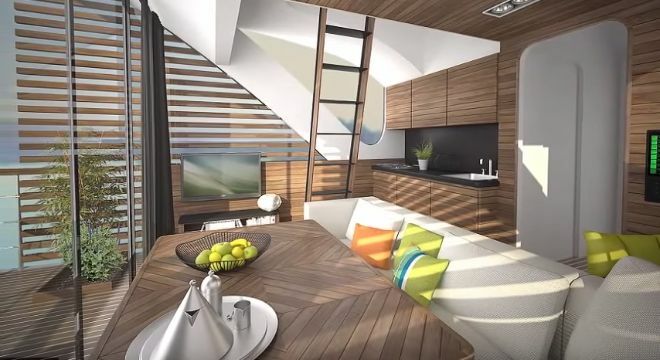 This would allow interested guests to spend longer stretches of time away from the central unit or to go further down a narrow waterway that would be inaccessible to a typical cruise ship. To be sure, each catamaran was designed to offer the same level of comfort and luxury as any floating hotel suite. Each unit has a salon, galley, bathroom, hall with storage, and an upstairs sleeping area. A simple conversion would allow the units to house 2 additional people by putting a double bed in the salon. Guest can face the Floating hotel catamaran to capture light when desired, and the slatted wood design in the salon offers a continuous view without sacrificing privacy. In fairness, Salt & Water was not the first design firm to conceive of a floating hotel. Architecture firm Dutch Docklands has already started construction on a snowflake-shaped floating hotel in Norway from which guests can view the beautiful Aurora Borealis. Dutch designer Marijn Beije has also made plans for free-floating catamarans. 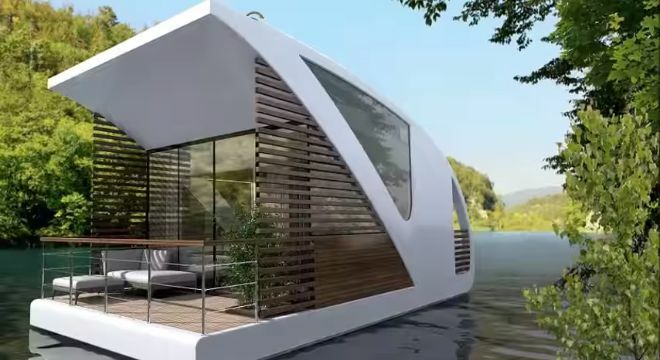 Designed as a floating eco-lodge, units are available for individual purchase through the partner company, APHoutconstructies. What Salt & Water offers, however, is a merging of two popular vacation ideals like has never been seen before. This display of architectural innovation and insight into the hospitality industry is sure to catch the eyes of developers.